In the 70's when I first became involved in Scottish salmon fishing there was no such thing as 'catch & release' and every fish that was caught regardless of its condition was killed which would have caused shock & horror in this day and age. Fortunately these days the vast majority of salmon anglers see the sense in returning salmon to ensure healthy future stock levels. The above aside there are still a few of the older anglers that cannot get their heads aligned with common sense on this issue. All species of wildlife & flora are under threat due to global climate changes that are currently happening for whatever reasons and commercial exploitation. We are undoubtedly in a different era of environmental uncertainty therefore it is essential that the older fishers get their heads out of the sand and engage their brains properly on this subject as each individual salmon is important to the future of our beautiful rivers. I've heard arguments against 'catch & release' which are based on nothing more than self centred greed for a 'child like' desire to retain one of nature's most iconic creatures. My advice to the old school minds who are the minority these days is to get with it and gain respect for the species that has enriched your recreational life to such a high degree and release your salmon. If you do so you'll gain a much bigger sense of satisfaction from the overall experience of catching one knowing that you've had your sport without killing that salmon's chances of reproducing. When you hook a salmon and it starts to fight it places similar stress on the fish as what it would be for ourselves if we suddenly went out a ran a marathon. Lactic acid builds up in the muscles of the fish throughout the fight so once you've landed the fish give it plenty of time to recover before letting the fish go. Sometimes this can take a few minutes so be patient and you'll feel the salmon starting to try pull away when it's ready to be released. There's a much more value in the entire experience of catching a salmon when you feel the added satisfaction of not only hooking, playing & landing a salmon but seeing it swim away afterwards. 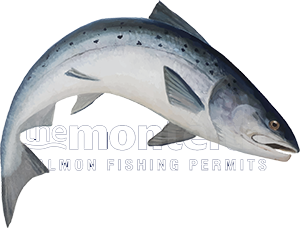 Treat your salmon with respect and treasure each experience which is made easy these days with all the modern photographic & video technology most of us carry in our mobile telephones. The wild Scottish Atlantic salmon runs entering all of the Scottish rivers are well worth conserving and releasing your salmon obviously plays a major part in that.